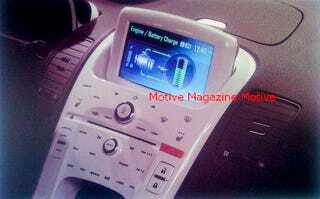 These shots of a production Chevy Volt interior have leaked from a GM internal presentation. Immediately apparent is the glossy white iPod-esque IP with flip-up nav/charge status display. There's also a prominent center-mounted computer-like on/off button, but we don't know if this will start the car or just the computer system. The 2011 Chevy Volt will be GM's first plug-in hybrid and a huge risk for the company; so does this interior make the grade?